Gasteiner – und der Moment ist deiner! Willkommen auf unserer Seite! The most beautiful moments in life are those you take a moment to enjoy. In the here and now, and to the fullest. Discover your moment! With Gasteiner Crystal Clear, the unique mineral water from the depths of the the High Tauern mountains. Scene setting songs – for quiet moments. With its still, mild and sparkling variations, Gasteiner’s range offers the right mineral water for everyone. Gasteiner Elements’ sparkling experience puts some zing in your life. Gasteiner Lemon refreshes you with freshly squeezed lemon juice. 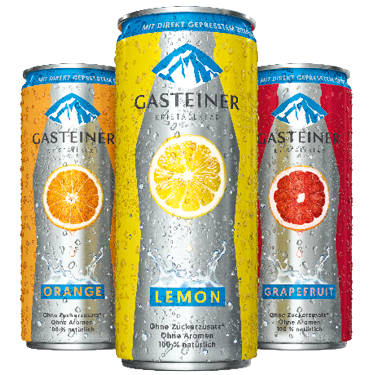 And, in their 0.33l cans, Gasteiner Lemon, Grapefruit and Orange are always to hand wherever you are with their unique 100% natural refreshment. The choice is yours - for your moment!